Dr Aneiros has literally changed my life. It sounds very dramatic to say that having my teeth done could have such a huge effect, but it truly has. For the first time I can smile without dropping my face to the floor or covering my mouth. I now have the confidence to talk to new people without wondering what they’re thinking about my teeth and while my family and friends always told me that they weren’t that bad it’s not how I felt at all. The dental team talked through all of my options and made it possible for me to have the work done at a price I could afford. 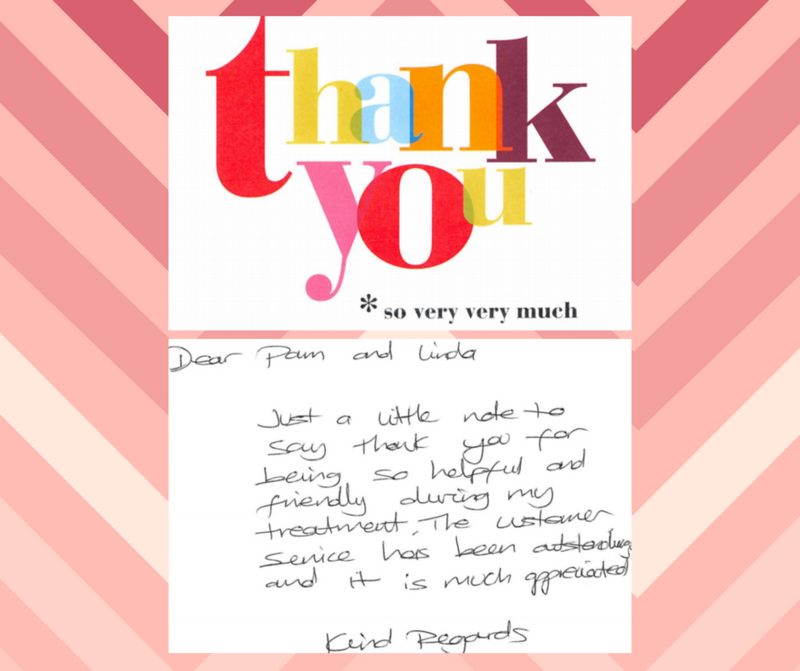 They were also amazing at explaining exactly what was happening throughout the procedure, which really helped to put me at ease. They were so friendly and professional that all of my usual worries associated with dentistry simply weren’t there. Now I smile freely and confidently. I can’t wait to smile from ear to ear on my wedding day and be proud of my teeth, which is what I had to work done for in the first place. I never imagined that it would affect the rest of me in such a positive way, but it really has. At 50 years of age and petrified with dentistry, putting off way too many check-ups, enduring what I now know was unnecessary pain and discomfort, I happened upon Dr Tom Sealey. Never before have I felt so at ease with anybody in a “white coat” with the exception of those attractive girls in the perfume counter in Debenhams, but you know what I mean. 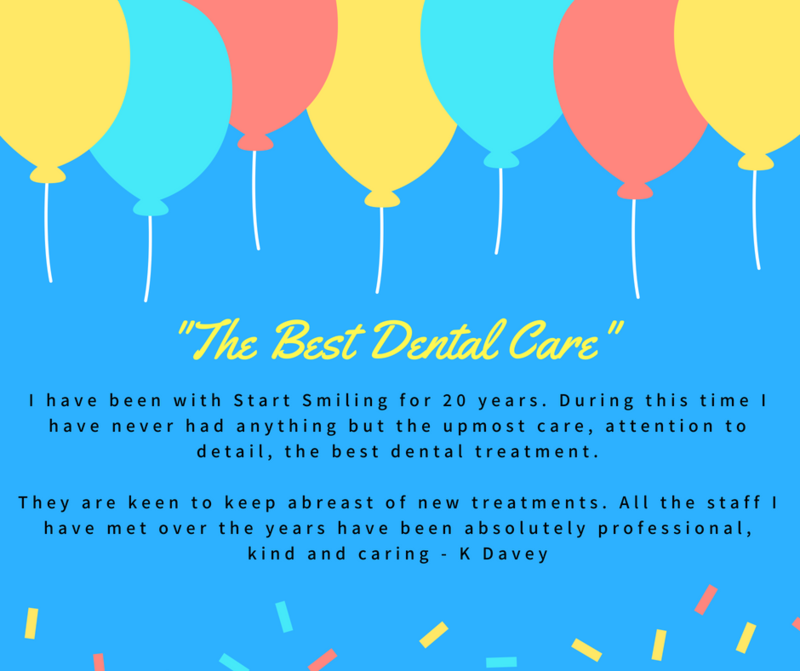 I have since undertaken, under his guidance, fillings, root canals, extraction and, more recently, dental alignment and a full smile makeover. I’m a Radio Presenter so it was with trepidation that I considered the possibility of major work in the area from which I make my living. After a very detailed and un-rushed consultation (allowing me plenty of time to have all queries and concerns answered) we discussed the various options that were available with a full explanation of the pros and cons of each and every treatment. 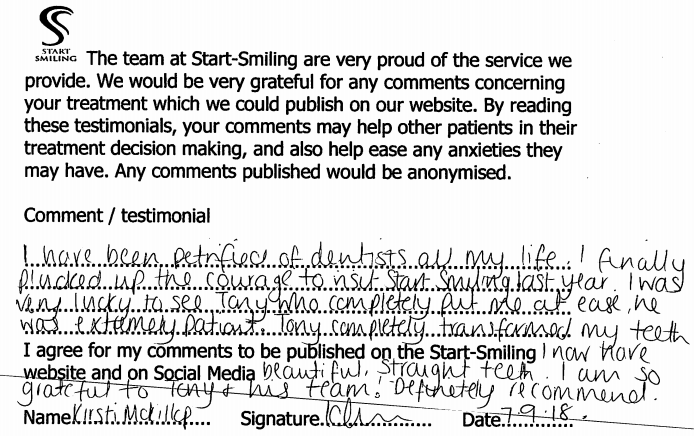 I had no doubt whatsoever that all available treatments were available to me and that whatever route I chose I was in the very best hands, a feeling that put me at such ease people who knew of my fear of dentistry (which really was immense) found astonishing; as if in their words “I’d been hypnotised” to be as confident as I honestly felt. 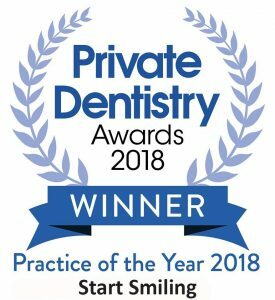 The team at Start Smiling, from reception to Rhonda, Dr Tom’s exceptionally capable, soft spoken assistant, made me feel I really was valued and that I would be guided every step with reassurance, from the very beginning through to what I hoped would be anything like as good as the portfolio of previous happy clients. I’m not an emotional man but truly shed a tear when after just months of C-fast braces whitening and bonding I had the smile I wish I’d had many years previous. I now smile in family photos as opposed to the hard look I had adopted, appearing to never look like I enjoyed the many happy moments spent with my family. As a successful Radio Presenter, it is not uncommon for me to be approached at what I’m pleased to say is a regular occurrence for a “selfie” which I have never been happier to now willingly take part in, previously I was embarrassed if I’m honest. My life has been turned around, I cannot recommend highly enough the professionalism with which Dr Tom and his team handled my treatment. I was informed, guided, valued and taken on a journey that has changed my perception of Dentistry, in a way I have never had such a u-turn in any profession. He and his team are a credit to the industry and I cannot recommend them highly enough to anybody that will listen. I will smile for many years at not just the results, but because the experience has given me confidence to tackle other tasks in life I didn’t think I could handle and do so smiling. “I am new to the area and asked my doctor to advise a dentist. He suggested Start Smiling. I faced some serious dental issues (through neglect) that had led to a heart problem and it was essential these were sorted. My experience has been fantastic. 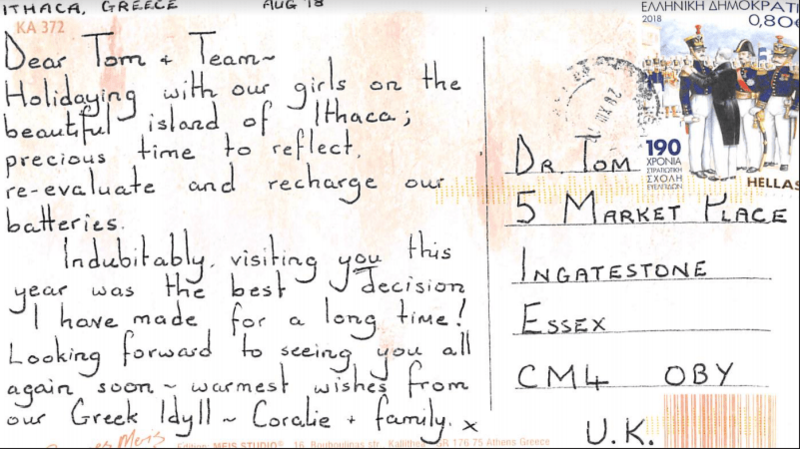 The staff there are always helpful and professional, and have given me total confidence in the procedures and advice.